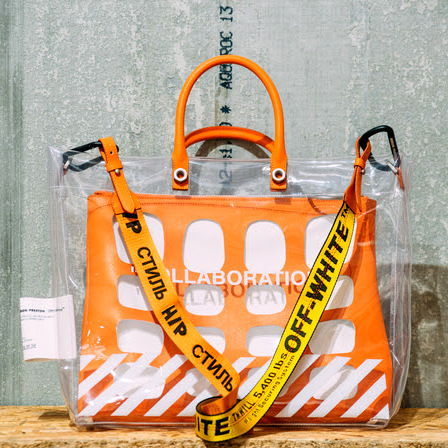 For their first collaborative release, Virgil Abloh (Off-White ℅ Virgil Abloh) and Heron Preston present “COLLABORATION”, a concept carryall that incorporates the designers’ common exploration of industrial elements. This accessory is a living hybrid: its dual-colored strap is a fusion of Off-Whites graphic yellow Weight Securing System strap and Preston’s signature orange band with the branded word “Style” in Russian. The strap is a purposeful note of asymmetry in a piece with clean balance. The transparent body is printed with Off-White’s famed diagonal white lines, along with the words “COLLABORATION”. Black carabiner clips secure the strap, while inside, an industrial netting-inspired inner tote is a textural contrast to the sleek exterior. Substantial industrial hardware finishes the design, with metal nuts that cleanly secure orange leather straps. Heron Preston is the true embodiment of an artist born of the post-internet generation. Multi-faceted and genre-bending, he is a cultural icon in youth culture, and emerging designer in high fashion. 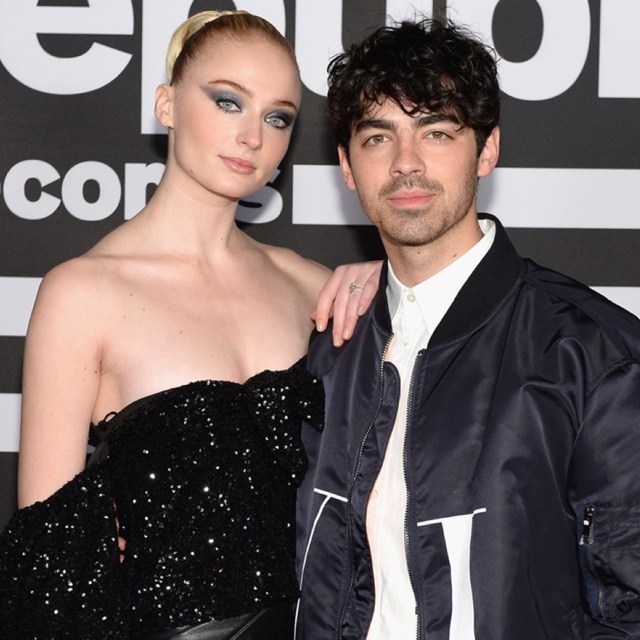 He founded his eponymous fashion brand in 2016, and in two short seasons has garnered an international following. The common thread among his impressive bodies of work is a commitment to innovation, experimentation, and unpredictability. Heron Preston finds particular joy in the unexpected; taking conventional themes and reinterpreting them. Take for example his “UNIFORM” project from 2015, the designer’s first major collection, in which he collaborated with the NYC Department of Sanitation on a series of zero waste themed clothes and accessories. He’s also served as the global digital producer for Nike and of course, creative consultant to Kanye West, most notably on his work for the Life of Pablo and Yeezy fashion label. Established in 2013, Off-White is defining the grey area between black and white as a color. Under the brand name, seasonal collections of men’s and women’s clothing, objects, furniture, and publications are articulating a current culture vision. Collections embedded in a recurrent back story with an emphasis on creating garments that have an identity by design. With a design studio based in Milan, Italy the label harnesses the history and craftsmanship within the country yet offers a global perspective in terms of design and trends. With a clear vision of splicing the reality of how clothes are worn and the artistic expression of high-fashion, creative director and designer Virgil Abloh explores concepts in the realm of youth culture in the contemporary context. This entry was posted in Design and tagged 360 Magazine, accessories, art, artist, artists, asymmetry, bag, black, brand, Brands, California, Canada, Cape Town, Celebrity, Chicago, China, clothes, clothing, clothing brand, clothing line, collaboration, collection, Colors, concept, consultant, contemporary, craftsmanship, creative, creative director, culture, culture magazine, Dallas, design, design studio, designer, designers, digital producer, edgy fashion, edgy fashion magazine, England, europe, experimentation, fashion, Fashion designer, fashion icon, fashion label, France, furniture, garments, Generation, genre-bending, Global Society, graphic, grey, handbag, Heron Preston, High-Fashion, icon, iconic, industrial, Innovation, international, Italy, Jakarta, Japan, Johanessburg, Kanye West, label, leather, life of Pablo, lifestyle, London, Los Angeles, materials, Melbourne, metal, Miami, Milan, Multi-faceted, Netherlands, New York, new york city, Nike, nyc, NYC Department of Sanitation, object, off white, orange, Paris, perspective, post-internet, producer, purse, release, rome, San Francisco, Southern California, style, stylist, Sweden, Sydney, trends, unconventional, unexpected, uniform, unisex, United States, unpredictability, USA, Vaughn Lowery, Virgil Abloh, vision, white, worldwide, yeezy, Young, youth, youth culture, zero waste on February 22, 2018 by wp360mag.